Having recently been selected as a finalist for ‘Excellence in Digital Communications’ and ‘Excellence in Communications via Meetings’, emotive and Novo Nordisk’s interactive patient case-study workshop, DiT has now been announced as a finalist in ‘The Judges’ Special Award for Innovation in Healthcare Communications’ category at this year’s Communiqué Awards. DiT is a peer-review, interactive workshop developed for Novo Nordisk, which brings patent case studies to life with an integrated and innovative digital framework. DiT presents patient case studies with the use of virtual mannequins to primary care professionals involved in diabetes management. 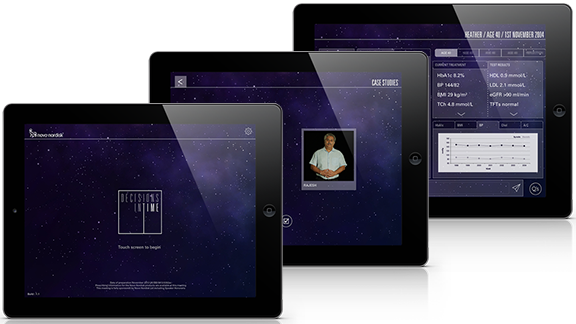 This medical education campaign embraces new ways of engaging healthcare professionals though the use of a bespoke iPad application, Prezi, key issues messenger and real-time responsive visualisations. emotive won ‘Excellence in Patient Programmes’ with MyAsthma at Communiqué Awards 2013 and has been Highly Commended in the Digital Interactive category with Astellas’ health economics app at the recent PM Society Awards. emotive are excited to be nominated in three categories at this year’s Communiqué Awards, which recognises medical communication excellence in European and international markets. To read more about Decisions in Time visit www.thinkemotive.com/decisions-in-time.html.